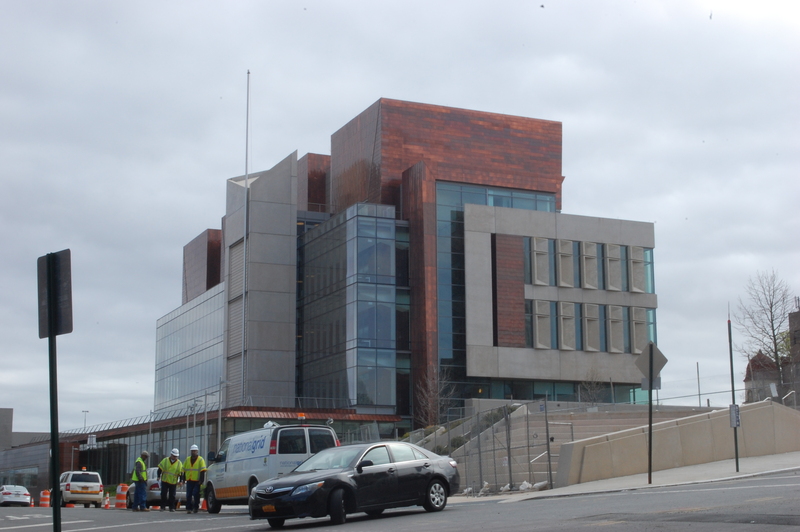 Staten Island Courthouse Construction Catastrophe Mimics Bronx’s. Any Big Media Paying Attention? Remember back in 2010/11 when the Bronx Hall of Justice courthouse construction went $100 million over budget accompanied by delays and scandalous conditions resulting in mice infestation, roof leaks and sewage pipes letting go of excrement? Well, at least that got some citywide coverage. I went to Staten Island today to get my ID NYC at an office over there (OK, way over there from the Bronx, but less of a wait list than to get it in the Bronx or Manhattan), and saw the new courthouse there still under construction. I was going to just post the following photo of the lovely building on Instagram. I like the way it looks architecturally much more than the Bronx Hall of Justice. But I just looked up this courthouse construction on-line and can’t find any citywide coverage about how delayed and costly it has been. Only the State Island Advance has written about it and that was a whole year ago, when it said the construction was “bedeviled by delays for more than a decade.” Wow! We have four citywide newspapers, and apparently none find this important enough to cover, much less explore any possible problems in other parts of the state. Maybe it’s just that citywide media doesn’t get over there much, or at all, to notice. (How could they not notice when covering the Eric Garner travesty a few blocks away.) Is the same true of the TV networks? And are Staten Island elected officials saying/doing anything about this? Let me know if I’m missing something here, folks. ← Jerome Avenue Rezone Proposal: BronxTalk Examines It Again Tonight (Part III).